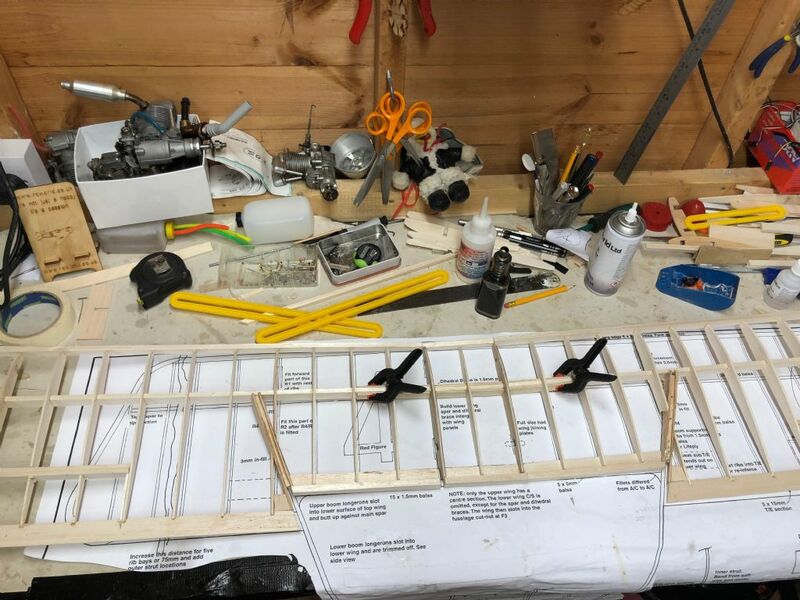 Making good progress Martin, re the ailerons,again have a look at Pete Neate's DH2 I have the article from the April 1975 RCM&E that I could scan for you ? Thanks Jeff. Have a had a look at those plans but not being a brilliant plan reader still cant make sense of them. Need to study them more me thinks. Great stuff, Martin. 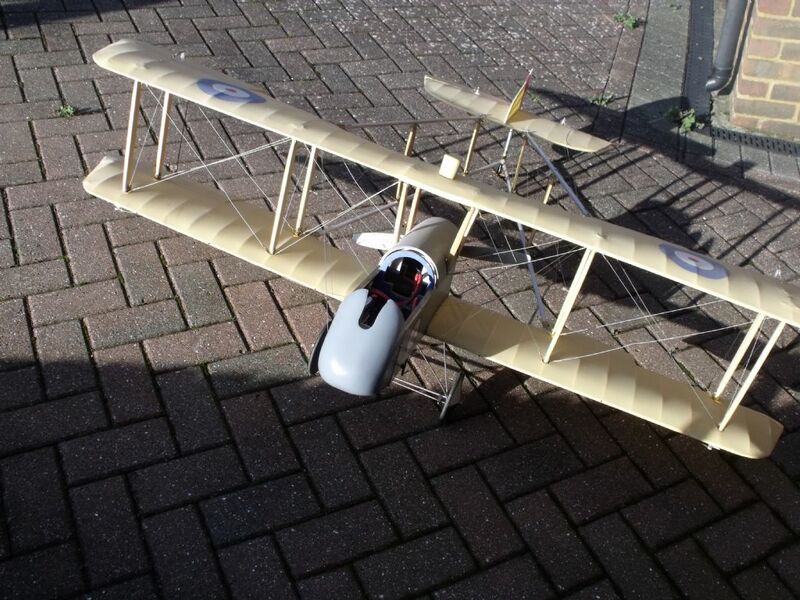 If you have a look in my album, you will see that I made an electric scratch-built Dh2 a couple of years ago. It was a great experience. It took me about 600 hours and I'm a bit too apprehensive to commit her to flight! She still hangs in my workshop, as a Hanger Queen, until I have the 'bottle' to take it to the field. I shall watch your project with interest. Happy landings, Roy! Hi Roy. Yes I have looked at yours several times. 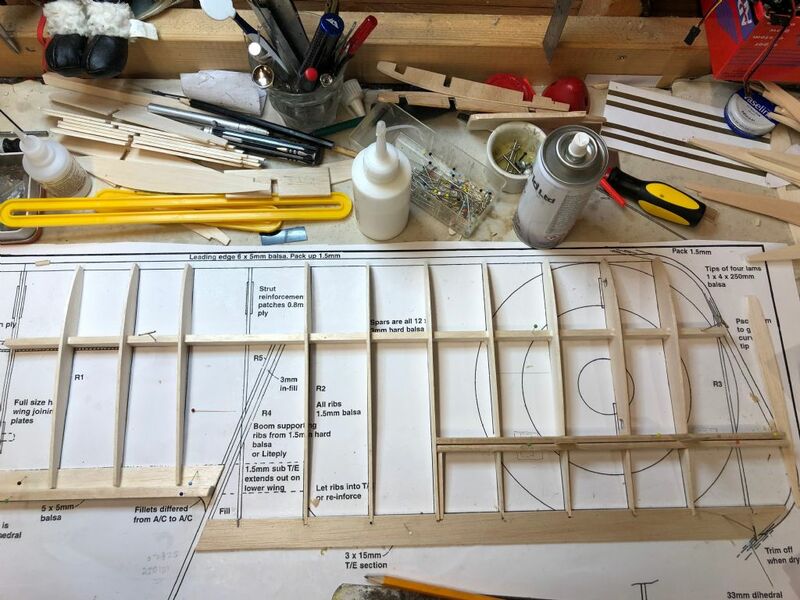 In fact only yesterday was using it as a reference to decide on how I would link the top and bottom ailerons and have decided to go with the pushrods. Wouldn't mind a sketch of your closed loop system if you have the time? 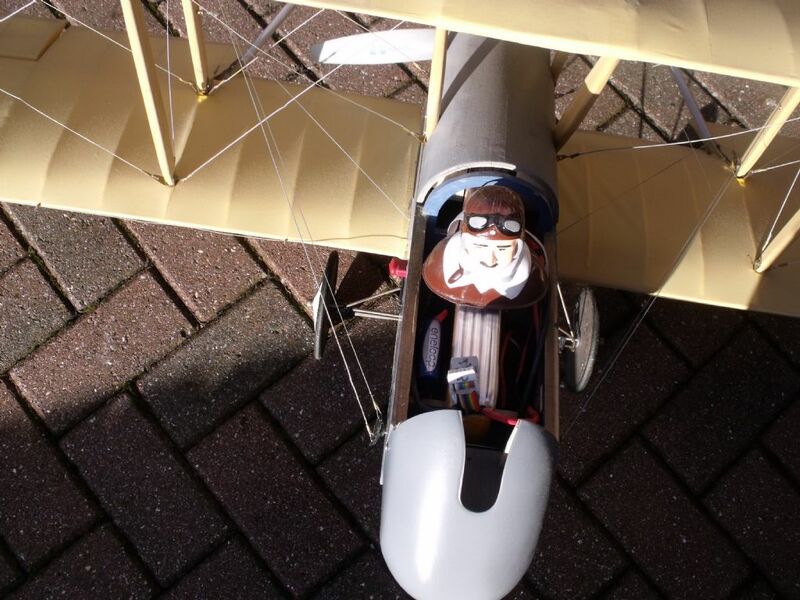 A great build Roy but the difference with me is I have to fly them. I've crashed a few scratch builds on maidens but at least I got to see them fly and its character building/ You should take the leap of faith. What's the worst that could happen? ok you may crash her but the second one will take only 200 hours!!! fitted and plumbed fuel tank. Nice and secure. Add 1/32 ply fuzz deck and engine mount. Think im going to put a Saito 62FA now rather than 82 which may be overkill and there isn't much to this plane in terms of structure and weight. 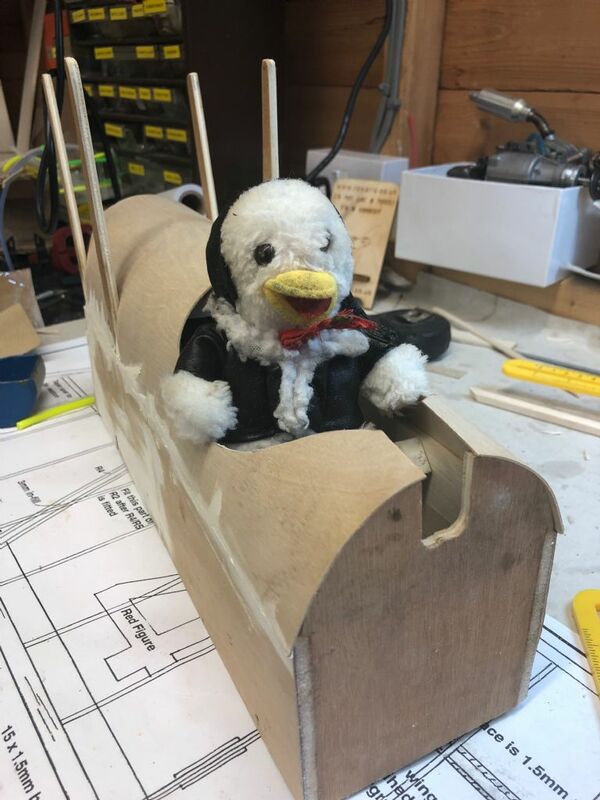 Trial fitted Wing Commander Mallard. I know what you may be thinking but he was given to me by my mother in law just before she passed away 20 years ago. Lovely lady and a fitting tribute. Hi Jeff why turn the tank around? Surely the pipes need to face the engine?? The tank needs to face the direction of flight so the clunk is at the back of the tank. Fantastic subject.I have long been put off building one of these not being sure about starting an ic engine in one and not wanting to do an electric version. Would it be an idea to have the tank on a bit of a tilt (if the bung end was at the engine end) so the clunk is at the bottom of the tank able to sip more fuel? When landing the aircraft it will have a nose up attitude and probably will in flight too, and any remaining fuel in a level-fixed tank will be up against the bung and the clunk left dry at the other end if fuel is low. 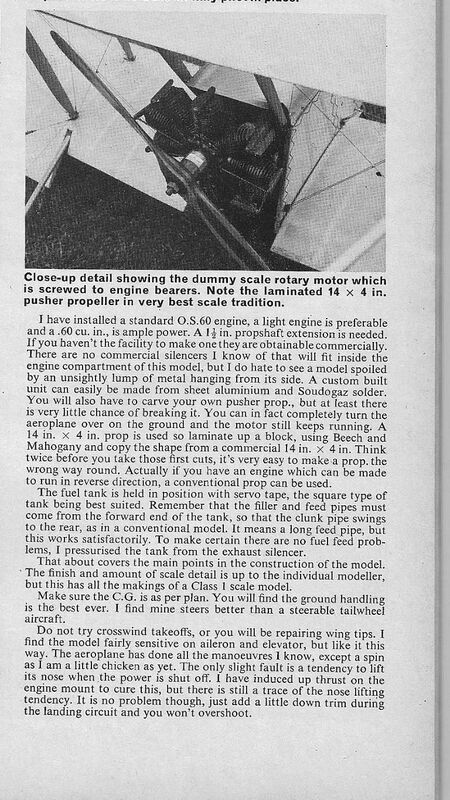 Sorry I'm wrong too - the article above seems right - in an steep upward climb the clunk would be out of the fuel if the bung is toward the engine! Hi again, Martin. Being more of an engineer and less of an expert with computers, I chose to photograph the ailerons wires, etc instead of making drawing and trying to get it onto this forum. This picture shows how I've used the cockpit cover to house the pilot figure and machine-gun. The pilot, Capt. Banks VC, is velcroed to the 10s LiPo. 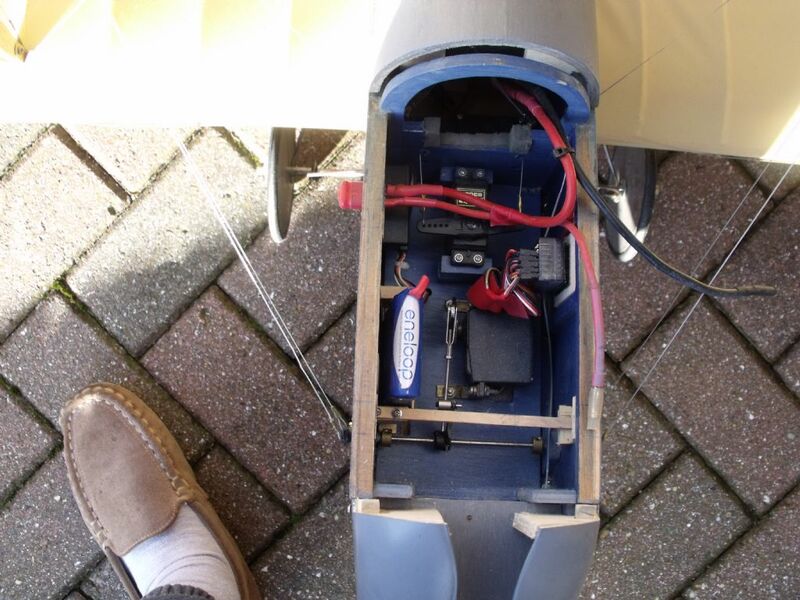 With the LiPo removed, the positioning of the aileron and rudder servos is shown. Please excuse the size 8 slipper! The great big red thing on the side of the fuselage is an isolator. The receiver is on the right wall, (as you look at it) and the elevator servo is at the front. The rudder servo is just out of sight behind the bulkhead. The rudder wires come through the fuselage walls, via pulleys to the tail. 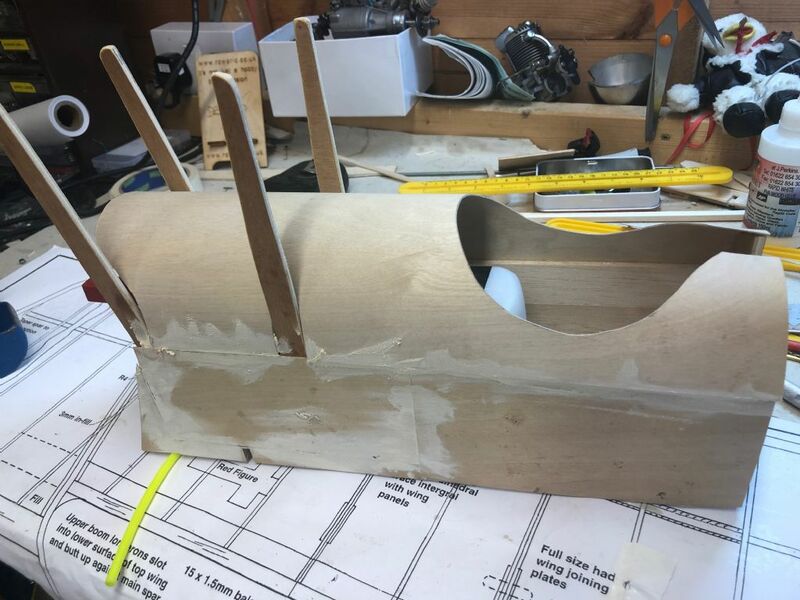 The aileron servo has the largest arms available, which pull straight through the bulkhead, via some fuel tubing, in a 90 degree arc, and out onto the leading edge of the lower wing. To keep things as authentic as possible, I've fed the wire through some small brass loops along the l/e. These might just be visible in other pictures. 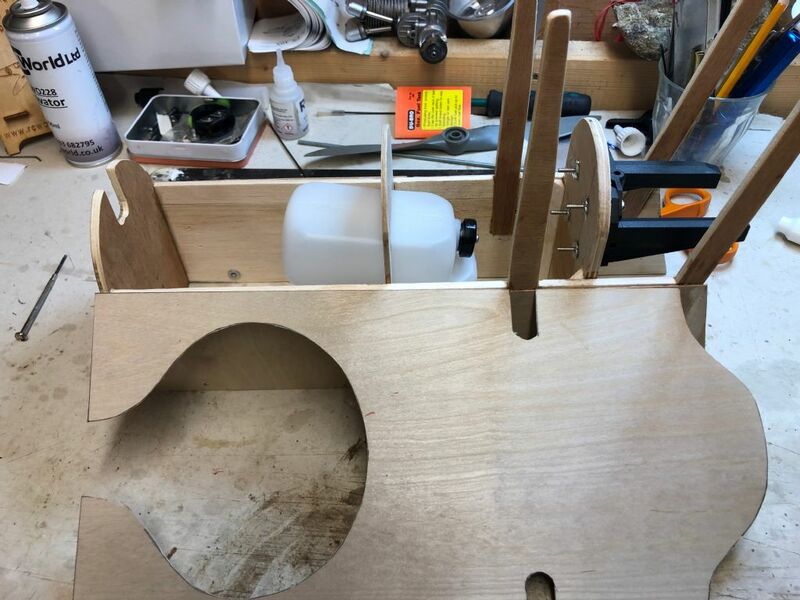 On the above picture, you can see how I have routed the rudder and elevator wires through very small pulleys mounted on the struts. These and the brass loops are available from a local model boat shop! A better example of the l/e loops. All the brackets supporting the flying wires are home-made. 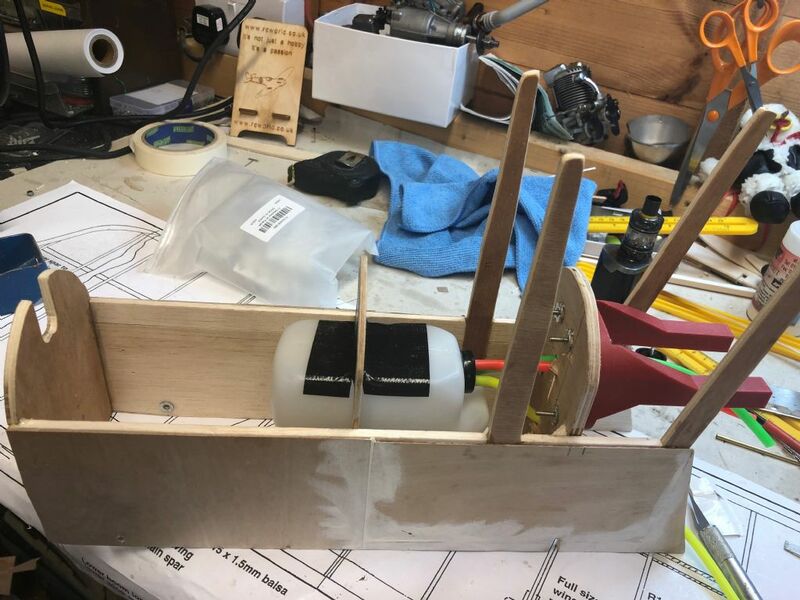 Under the outer strut, I constructed a bell-crank to transfer 'pull' to the aileron, where adjustments can be made at the clevis attached to the horn. Power is then transmitted via the carbon push-rod to the upper wing. Another horn on the top of the upper wing has a clevis connecting the wire, which disappears into the upper wing via more fuel tube. What can't be seen, on the picture above, is another pulley mounted in a substantial bracket inside the wing, which alters the direction of travel along the wing. 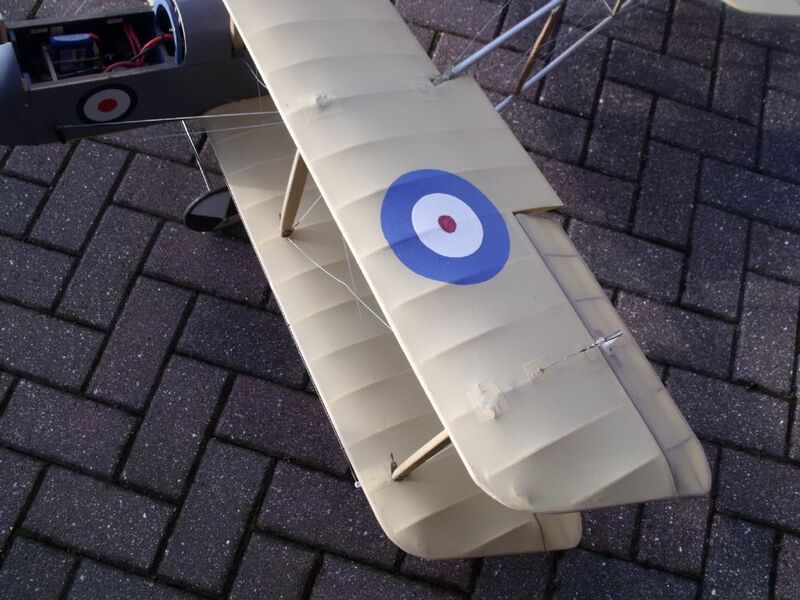 All the wing ribs on the upper wing have holes cut in order to allow free movement with the minimum of resistance. The whole rigmarole is repeated, in mirror image on the other side of the aircraft, bringing the wire back to the servo. The above picture shows how I connected the elevator wires, which are also 'pull-pull' and the bracing wires to hold the tail square. 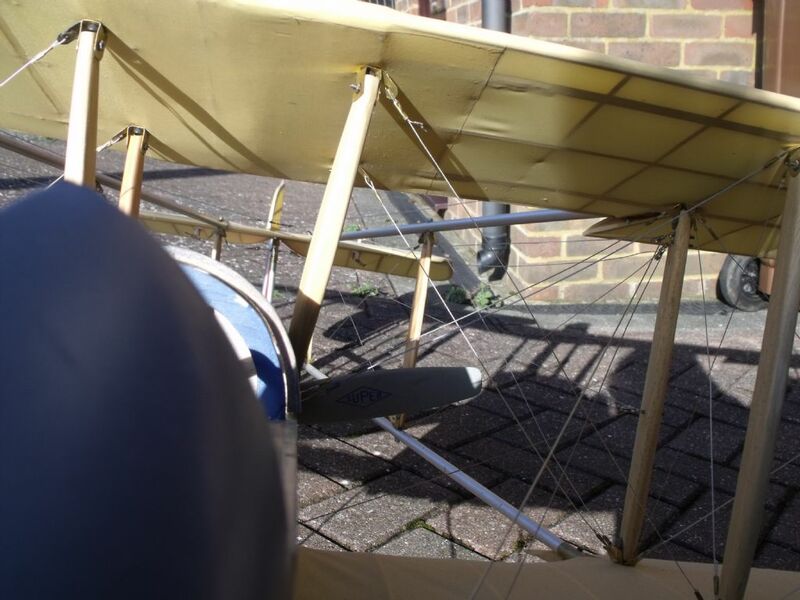 Having gone through this, I found that with such a long run for the aileron wire, a lot of play is evident. 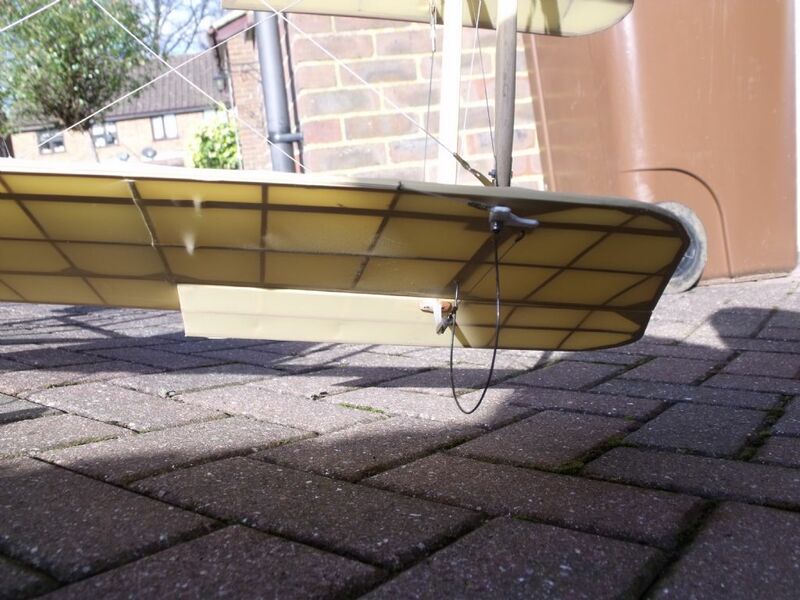 I am toying with the idea of leaving all the aileron wires is situ but disconnected, and installing slimline servos in the lower wing operated with a Y-cable. 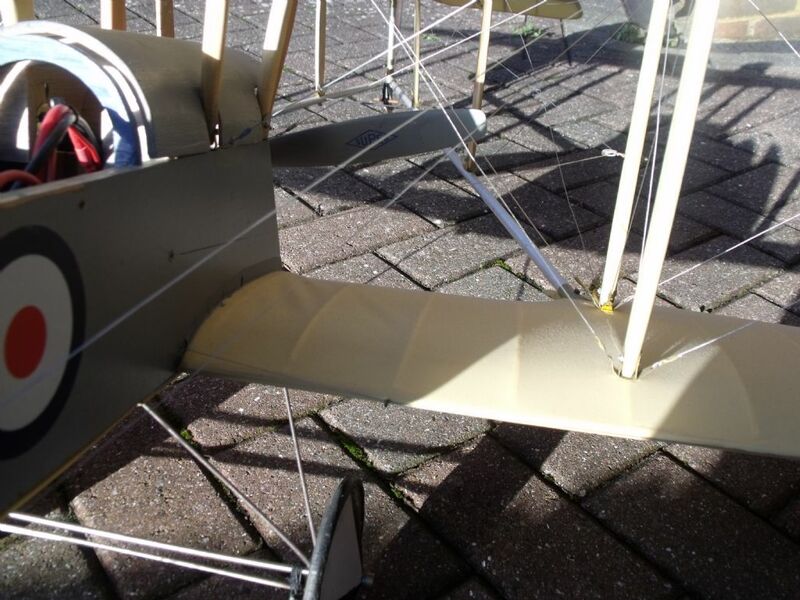 Although I love this aircraft, particularly as it is 'scratch-built' it could become rather burdensome in transportation by being almost impossible to rig and de-rig at the flying field! I hope that this has been of some help. If you require any more info, please don't hesitate to ask. Happy landings, Roy. Hi Martin. No doubt about it. 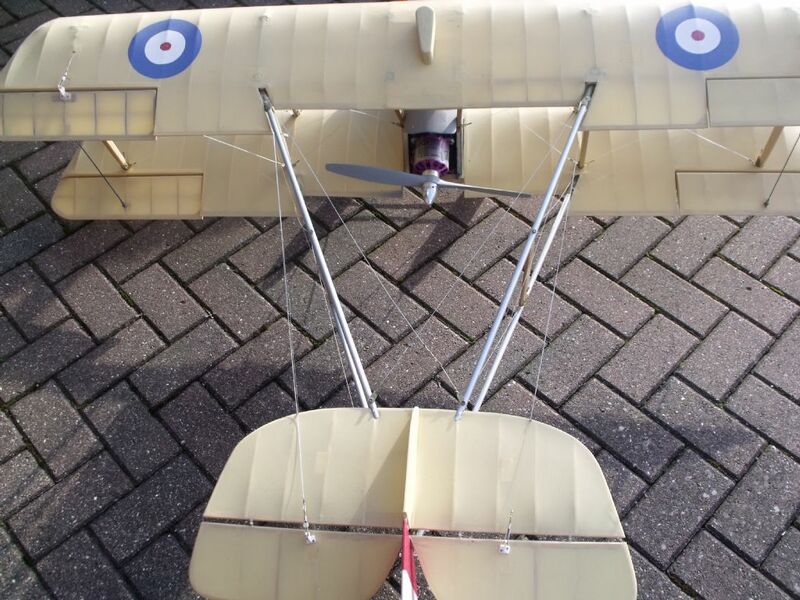 I believe that the aircraft could still maintain its scale integrity with 'dummy' control wires, and slimline servos in the wings. 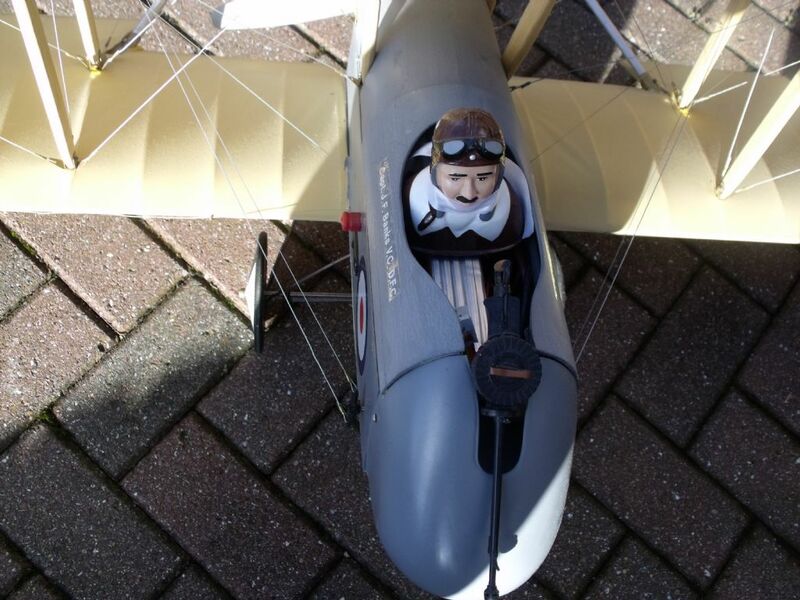 I am going to take the plunge and get it in the air this Spring. I'll keep you informed! All the best, Roy.